Bann Valley families genealogical data. The River Bann flows through Ulster (in northern Ireland), separating Londonderry from Antrim. It drains Lough Neagh (which you can hardly miss on any map!) to the north, meeting the sea at Coleraine near the Giant's causeway. The map shows the area but does not include a lot of detail: if you want detail, buy a professional map! However, if there are places in the area you wish to locate then join the mailing list and ask there! a page of place names, where we are gradually listing place names in the Bann Valley, with their various (mis)spellings that occur in the documents here, and are identifying their location. 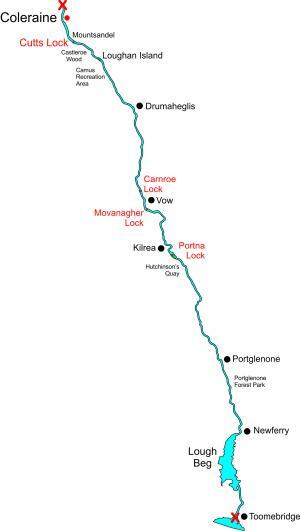 a map of the Lower Bann navigation. There are two a mailing lists associated with this site, One is for discussing matters related to Torrens families genealogy and the second for anyone descending from the Bann Valley families. Since many of the Torrens families originated in the Bann Valley area, the two lists are closely related! See Genealogy Mailing Lists for full details and how to join or use the 'Join Us' button on any page. Also available are the mailing list list archives. In 1998 and again in 1999, Lavonne Bradfield visited the Aghadowey/Garvagh area and collected a huge amount of data. She was busy transcribing this and other data which is on this site. Lavonne died in February 2018 so her own site has been incorported in the Babb Valley Data. Lavonne's own site is still available but she lost the ability to update it so many of the links are now dead. A search of the genealogy on this site (use the search button at top) for "Lavonne" will show how very much we are all indebted to her for her tireless data collection. Most of the original records in this section were collected in person by Lavonne during visits to the area. They are now being added to by others. They have their own index page. Note that the index page is called 'contents.html' rather than 'index.html'. This is so that the default link http://www.torrens.org/Genealogy/church/ will give you a directory listing - there are several sets of records here which are not in the index page (yet!). Family records Much of the data available are arranged by name rather than by source. So if Bann Valley members submit data sorted by name, it will be added here. Note that most of this area is extracted from emails sent to the Bann Valley mailing list, so it is mostly in text format and has not been indexed. Miscellaneous documents that don't fit elsewhere. File Upload area Members of the Bann Valley mailing list may upload documents to here for others to read. Some notes on names found in the records, including a table of nicknames and their full length versions. Books. This includes not only a list of books of interest to researchers, but also a transcription of Kernohan's "The Parishes of Kilrea and Tamlaght O'Crilly". British Family Bible records. This area aims to collect family bibles and restore them to their correct families. As part of that process, the information contained is also being transcribed to the site. Old Age Pension records contain some otherwise lost data from 1841 and 1851 censuses of Ireland. Griffiths Valuation 1858 and 1859 only the names have been listed, with Townland. Available records - A page started to attempt to list the records available, what they contain and where they may be obtained. This is a long task which is ongoing and I, Richard Torrens, welcome help, feedback and additional links or corrections. Torrens families genealogy also on this site, gives a lot of background to the Torrenses of the Bann valley. Much is of interest also to other families as there are of course marriage and other records and there are several documents quoted there. A page of links to other sites of interest..